It took just a moment to fall in love with him, but it will take a lifetime to forget him. We met Craspedia in a field, a tall handsome fellow with a kind eye who stood calmly and quietly while we said hello to him. 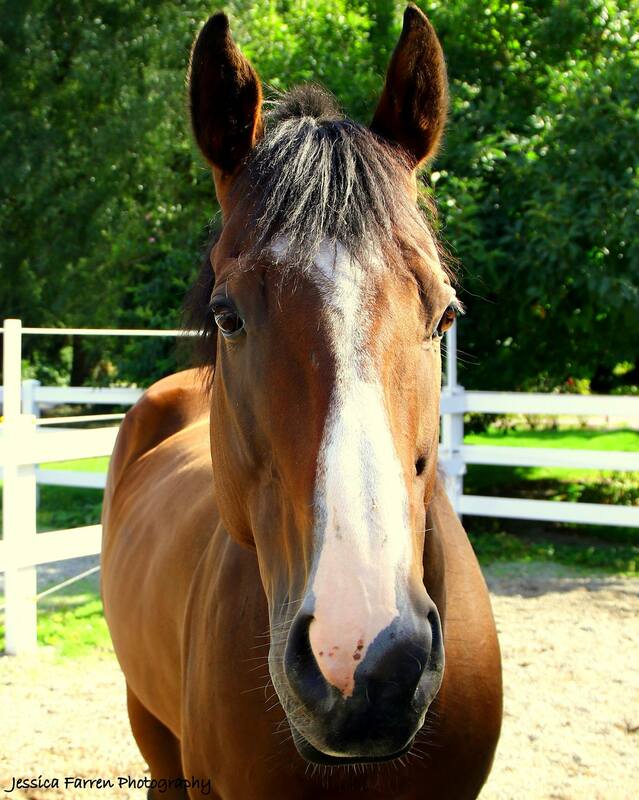 His owner had contacted us a few days before, concerned that his new horse was getting thin. It had been two months, he told us, and he did not understand why his horse was not gaining weight from the grass in his field. This was not much of a mystery to us. It was one of the driest summer on records, there was hardly grass available in any local field, and the horse was a thoroughbred just off the track. We were particularly concerned because his owner was an individual that SAFE had already declined as an adopter. For various reasons, this individual was not prepared for horse ownership. We agreed to go take a look at the horse and see what we could do to help. At first, we thought were looking at a horse that we could easily rehabilitate and rehome. Then we walked to the other side of him, and saw his left hock. It was enormous, tightly swollen and painful looking. We asked the owner what had happened, and he seemed surprised to see it. He told us that when the horse arrived from the track, he was turned out in the small field and had run around like a maniac. He had also broken through the fencing and gotten into a tussle with another horse at one point. Or maybe he had been like that when he arrived? The owner was not sure. With heavy hearts, we returned to SAFE and started researching. 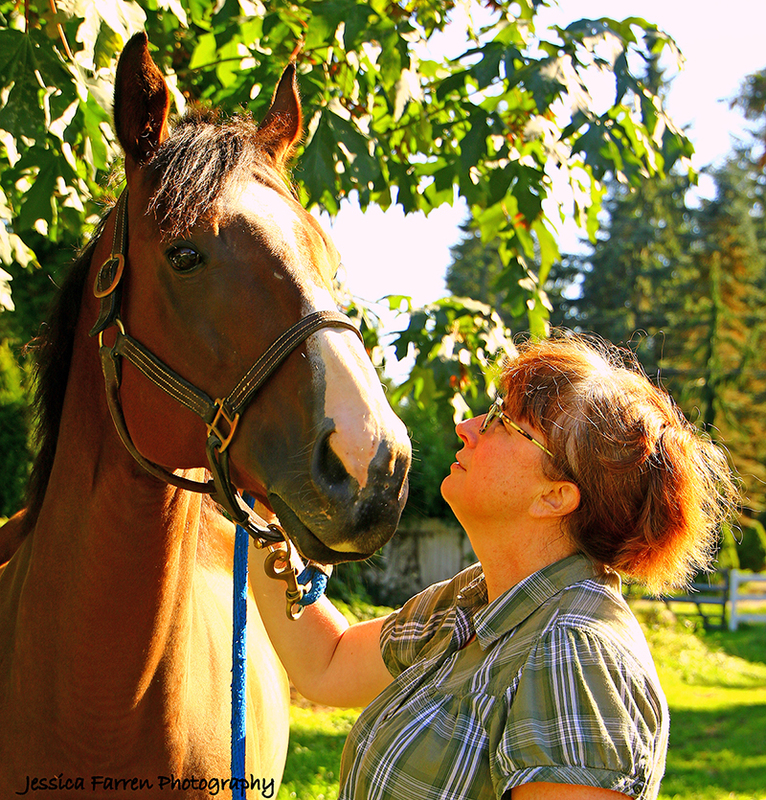 While Terry contacted our veterinarian to discuss the horse’s physical symptoms, I began piecing together his history. His name was Craspedia, a well bred 8 year old gelding, born in Kentucky, who spent five years as a racehorse, compiling a record of 4–3-6 in 19 starts. His racing career took him from Vancouver BC, to Southern California, to Arizona, and finally to Emerald Downs, where he raced 6 times in 2015 as an 8 year old. His last race was on July 12, 2015 and he finished a respectable 3rd, bringing his career earnings to almost $33,000. The next day, July 13, he was sold to his current owner. The trailer he brought was too small for a 17 hand thoroughbred, so Craspedia’s race trainer hauled him to his new home. As the day went on, we grew more and more concerned about Craspedia’s leg. He needed vet care. So we hitched up the trailer that same afternoon and went back to get him. His owner signed him over to us and we brought him to Safe Harbor to await a visit from Dr. Fleck of Rainland Farm Equine. Dr. Fleck only had to glance at Craspedia’s hock to know how grim the situation was. Radiographs confirmed that the hock was fractured. Several bone chips were evident from a fracture to the lateral malleolus and there was damage to the lateral collateral ligament as well. There was no question of letting it heal up on its own; the horse needed surgery if he was to have any reasonable quality of life. But there was no guarantee that surgery would be successful. The x‐rays told us it was a bad injury, but without scoping it, it was impossible to know the extent of the damage. We had an agonizing decision to make. With a hefty amount of pain medication on board, Craspedia settled happily into his stall at Safe Harbor and proceeded to charm everyone who came near him. For a horse so fresh off the track, he was remarkably calm and kind. As his intelligent and soulful eyes gazed at you through his long, lovely forelock, it was impossible not to fall in love. He liked to be petted and talked to, he ate his timothy hay with appreciation, and he followed his stall cleaners around like a big puppy. It was very hard to see him in such awful condition but it was easy to picture the horse he should have been had things gone differently for him. Thankfully, our decision on whether or not to do surgery was not limited by finances. Dr. Fleck quoted us a discounted price that was reasonable for a surgery and donors had come forward offering to cover the expense. The decision rested on whether surgery was going to be the right choice for him. We knew the best outcome we could expect would be some form of pasture soundness. He was a relatively young horse with many years in front of him. 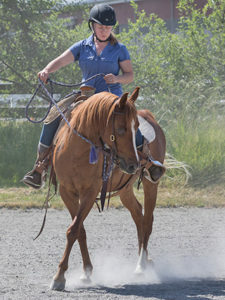 Portland, another former racehorse, had recently been responsibly euthanized by his owner following years of discomfort from arthritis and we were reluctant to risk putting a horse through years of pain out of a desire to save him. Each year, SAFE intakes a number of horses suffering from neglect, some of which are quickly humanely euthanized to prevent any further suffering. While these decisions are never pleasant, making the decision is usually straightforward. We had collectively decided that the responsible choice was to let Craspedia go and had scheduled an appointment to euthanize him, but we struggled with the decision. Dr. Fleck, seeing how we were struggling, offered to take Craspedia into surgery and assess the joint at a minimal cost. If the hock seemed salvageable he would proceed with the surgery. If not, we would have our answer. SAFE has always been blessed with the support of amazing horse professionals but this act of kindness and compassion is something we will never forget. Yesterday morning, Craspedia went into surgery. We waited anxiously all morning for news, hoping that it would be good. In the end, the hock was too badly injured. The damage to the lateral collateral ligament was extensive, the cartilage of joint capsule was thickened and damaged, and the fracture was more severe than the x‐rays could show. Even with the bone chips removed, Craspedia would be in pain, and that pain would only increase as time went on. Had the injury been treated when it occurred, he might have been savable, but it was simply too late. Dr. Fleck grimly advised us not to proceed with surgery. We had our answer. Craspedia is free from pain. We can take some comfort in knowing that we did everything we possibly could to save him. He will be missed terribly. There is a lot to be learned from what happened here. This is a textbook case of what can go wrong when a retired racehorse is not properly transitioned to its new life away from the track. Craspedia was taken straight off the racetrack, sold to an individual with no experience or knowledge about Thoroughbreds, and thrown into a field full of hazards. We can only speculate about the cause of his injury, but it is likely that it happened because he was allowed to run out of control in a small field. This is a horse who spent the majority of his life having his day‐to‐day routine and movement controlled by humans, whether on the ground or on his back. Eventually he would be able to safely enjoy his freedom, but the day after his last race was too soon for him to be left on his own. There are many skilled riders and trainers who understand how to transition a racehorse to another sport and how to keep good weight on them, and who can recognize a serious injury if it occurs and get it taken care of in a timely manner. 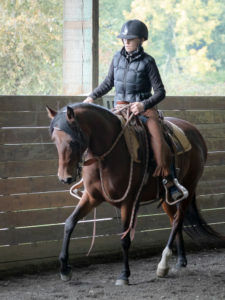 Many people looking for an inexpensive horse do not have these skills and they need to take the risks that come with restarting a racehorse very seriously. In this case, the owner’s refusal to take the responsibilities of horse ownership seriously lead to the early death of an otherwise lovely horse. Unfortunately, this is not an isolated case. Many racehorses end up in inappropriate homes when buyers are unrealistic about their own skillset. Craspedia’s story caused a great deal of distress and heartache, both at SAFE and following conversations with individuals at the track. The big question that came out of those discussions was “How do we prevent horses going to buyers like this?” SAFE had been able to screen this prospective adopter out through our application process. 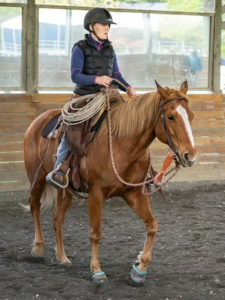 While our application is long, it does a fairly good job of sorting through people who are prepared to be horse owners and unprepared individuals looking for a cheap horse. As a result of these conversations, SAFE was given the opportunity to try to reduce the risk of selling a racehorse to an inappropriate buyer. We submitted a streamlined sample application with questions that a potential buyer could be asked, in hopes that this will help separate unsuitable owners from those who can give a thoroughbred what it needs to be successful off the track. That application was printed in the catalog for last weekend’s Thoroughbred Showcase at Emerald Downs and we sincerely hope that can be a useful tool for trainers in the future. Craspedia, you deserved so much better than what happened to you. Still we are better for having known you and better for having had the chance to show you how deeply we cared. You will be missed. You will not be forgotten. So beautifully written. The concern you express for all the horses lucky enough to come to SAFE is so admirable. Kudos to Dr. Fleck for helping out. He’s been our vet for over 30 years and is kind, compassionate and a great doctor. How generous of him to help you with this poor horse. Animals are at our mercy and the efforts of SAFE help to save them from ignorance and cruelty. Thank you. Bonnie — thank you for this beautiful write‐up and thank you for your work to educate the racing community. Such a sad story! I will always remember what SAFE does here.